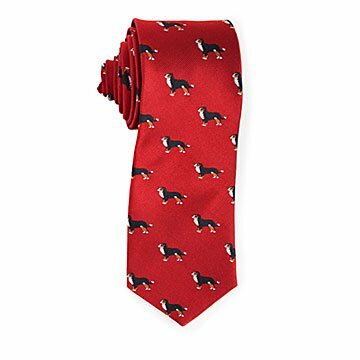 Take your dog to work with these breed-patterned neckties. Take your dog to work or any buttoned-down occasion with these breed-patterned neckties. Featuring your choice of 17 popular pooches—from Airedales to Yorkies—woven into the jacquard fabric, they're wearable tributes to your four-legged friend that obediently complement your wardrobe and make great gifts for the well-groomed. 100% imported silk. Made in New York. Very classy and cool looking tie!! Our son in law LOVED this tie!! He coaches a high school hockey team whose colors are blue and gold, so he will be wearing it to games!! I would buy this tie again. Purchased as a gift for a dog lover. I thought it was a nice tie that was kind of silly but I really liked the option to pick from all of the different dog breads. However, I wish that while picking the tie the picture would update so the tie wasn't a surprise in the mail. This tie is beautifully made. He loves the tie and the fact it reminds him of our first dog Pele. This tie is great quality, a special and unique Christmas gift for my son. I shall give this tie to my friend in the near future. I am sure it will be a favorite tie in his collection. I would recommend to Pug lovers!